The bidding opened several weeks back with a starting bid of $9,000 and ended up receiving a total of 10 bids. The bidding shot from $12,000 to $17,000 during the cards final day on the auction block, prompting an auction extension of 2 1/2 hours. Ultimately, the card came up short of expectations. 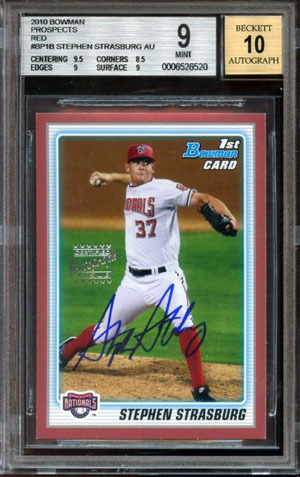 Many collectors felt that the card was superior to the 2010 Bowman Stephen Strasburg 1/1 Superfractor that sold for $16,403 and $21,403 during it's two stints on eBay. Various factors could have come into play, it certainly couldn't have helped that on Tuesday, the day before the auction ended, Strasburg was scratched from a start with "shoulder stiffness". That "red flag" could have raised "red flags" for collectors planning on bidding on the red auto. The card sold for $19,975. You forgot to add the 17.5% buyer’s premium.